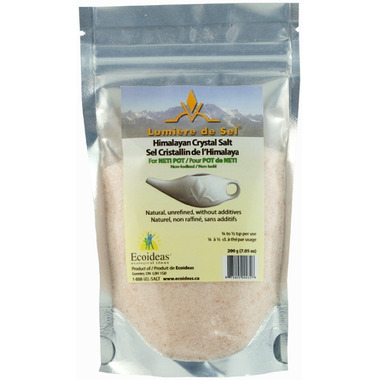 Non-Iodized Lumière de Sel® Himalayan Crystal Salt for use with the Neti Pot. Natural, unrefined, and ground finely to quickly dissolve in water. A neti pot is a small ceramic pitcher that is filled with salt water to cleanse your nasal passages. I have usually used premixed packets of neti salts, and tried this when I ran out. I must have used too much of it, as I gagged when I tried it. Using less, rather than more, is probably a good idea and make it more economical. I usually use the pre mixed pricey packets and I thought this would be a cheaper alternative but using the pink salt wasn't the same as the packets, it kind of burned because the salt is not buffered like it is in the packets. Very satisfied with product and much better price than others on the market. Bought this product for my dad, he's been using a neti pot with non-iodized salt for a few years now. Great product, good quality crystal salt. BEST value! We use a saline vaporizer and this purchase has worked beautifully and for a fraction of the cost for the branded refill. Very pleased! Shipped quickly and best value I've seen yet. My only very minor complaint is that it never seems to completely dissolve - likely just not quite ground fine enough. Works perfectly in my neti. Neti salt tends to be way overpriced, but the cost of this one is very reasonable. So much cheaper than buying premixed packets. This works very well. It took a week of eyeballing teaspoons to get the perfect sense of how much to use, then I bought a small measuring spoon set.